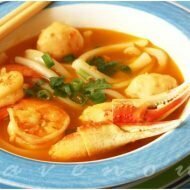 Canh bun is a lessor known variation of the bun rieu (crab noodle soup) and is very popular in northern Vietnam. 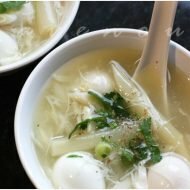 Many moons ago we posted about a small restaurant called Quan Bun Ban Mai that has some of the best version of this soup in Little Saigon. Several key differences between exists between canh bun and bun rieu. 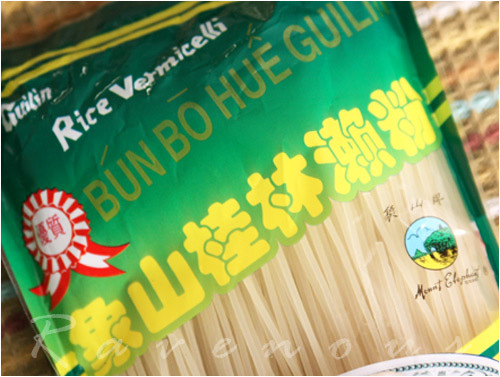 The first key difference is the use of a thicker rice vermicelli similar to the type used in bun bo hue, rather then the very thin rice vermicelli. This noodle is first precooked in boiling water then cooked again in the soup, rendering it silky soft and smooth. The second major difference is the use of rau muong (ong choy, water spinach, kang kung) that is cooked in the broth infusing it with this favorite staple vegetable. 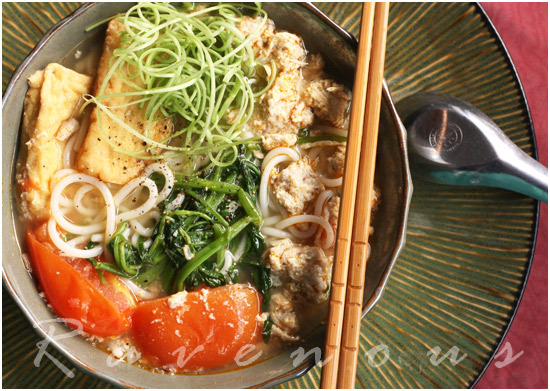 Just like bun rieu, you can fancy canh bun with blood cake, shrimp paste, or periwinkle snails. We’ve had this recipe in the queue for quite sometime and have had several requests, so here it is–it’s almost a repeat of our bun rieu recipe but with a few key changes. Soak dried shrimps until softened, roughly about 1hr, and then mince finely. A small food chopper will work nicely here. Cook the thick vermicelli noodles al dente and set aside. Add pork or chicken stock into large pot and bring to boil. In the meantime, make the crab mixture. Combine ground pork, crab, can of crab meat in spices, shallots, fine shrimp paste, fish sauce, coarsely chopped dried shrimps, pepper, and sugar. Add the beaten eggs and mix well. When the stock comes to a boil, slowly add this crab mixture into stock. Now add the tomatoes and tofu and bring to boil again and then turn off heat. Finally, season stock with additional salt or fish sauce. Mix in tomato paste or annato seed oil for nice distinctive reddish color broth. Ladle individual servings of the broth into a smaller sauce pan and add the cooked vermicelli noodles and a heaping handful of the rau moung and bring this to boil and serve immediately. Cooks note: Keep additional boiled rau muong as a side. 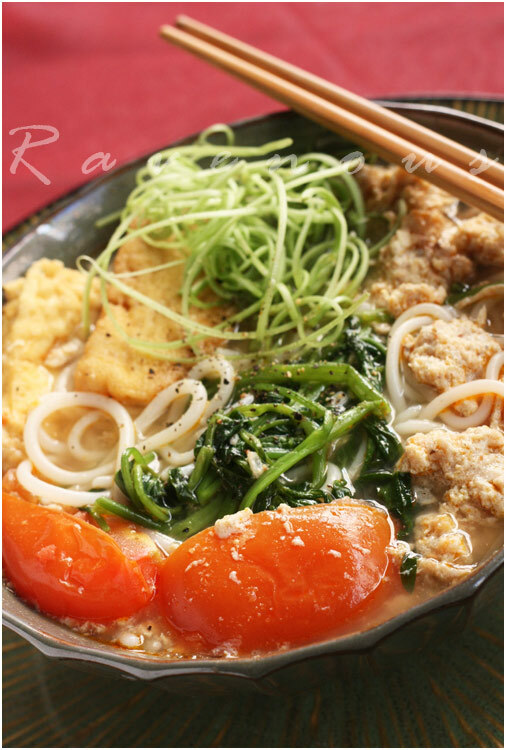 So the next time you’re craving for bun rieu and make a big pot, make this easy twist and turn it into canh bun! Close your windows–garnish with some fine shrimp paste and a squirt of lime and enjoy! looks good! i want some! Are the green julienned noodle like topping the shallots? I may do something similar. Will have to thnk hard how to substitute the pork though! cooking practice: we try our darnest!! Anh: chicken broth would be fine, wouldn't it? LOL!!! Close your windows?!? All the more to enhance the smell of the shrimp paste, eh? Anyways, your blog is very prolific – I enjoy reading the posts & drooling. I'm not familiar with blood cake or periwinkle snails, but I love Vietnamese food and will try any dish you make. You know, I love to see noodle dishes topped with all sorts of condiments and ingredients. So appetising! The soup must taste really sweet, no? Sounds excellent and I would love to try this with blood cake or periwinkle snails, very neat! Yum. Good Stuff. I like the last comment about closing the windows so the neighbors don't smell the shrimp paste! Awesome. sorry we haven't been able to reply to your comments..been a busy week! Looks amazing and delicious – what a treat! Your posts are amazing. I am so new and glad you visited mine. I love the pictures, etc and I would love to make a water spinach dish this week, but bummer cannot find it! So I can look at yours and admire. Love seeing more Northern Vietnamese cuisine! This looks like a very nice treat! Delicious-looking! I haven't had Asian dish for months now. OMG your recipes look delicious. 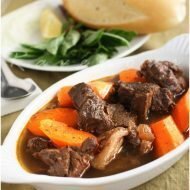 I am Vietnamese and I’ve been trying to find recipes for these dishes. Thank you for posting them! I made this dish last night! It was so delicious. Thank you guys. This was a childhood favorite for me in VN. My uncle’s next door neighbor was a vendor and was always so sweet to share what she didn’t sell with me. I have always had it with a rau muong sauteed with garlic and fish sauce as an accompaniment. It adds a certain depth of flavor.